Amazon keeps on coming up with exciting contests, quizzes and giveaways on their platform especially their mobile app to engage users and also celebrate some important days of the year. On occasion of Pt. 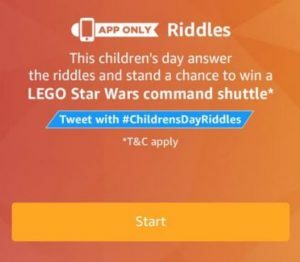 Jawahar Lal Nehru’s birth anniversary, which is celebrated as Children’s Day, Amazon has come with a riddle contest on their app in which you need to solve 7 simple riddles and you might get a chance to win LEGO Star Wars command shuttle for absolutely free of cost. We have also added answers to all the riddles below in case you are stuck at any one. So, hurry up and participate now. 1 How to win LEGO Star Wars command shuttle from amazon ? 1.1 Q1) I can fly without a pilot, you’ll often find me in a bored classroom. What am I? 1.2 Q2) Balance me on one finger or many to take me for a spin. I can help with both, concentration and distraction. What am I? 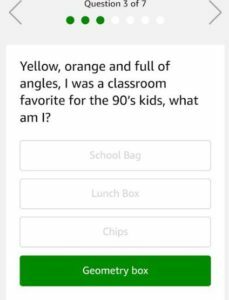 1.3 Q3) Yellow, orange and full of angles, I was a classroom favorite for the 90’s kids, what am I? 1.4 Q4) With me, you can climb up a rung or slide down with a hiss. What am I? 1.6 Q5) I have a red Queen but no King. I have wood but no trees. What am I? 1.7 Q7) I was NOT one of your favorite characters from Tinkle comics. Who am I? 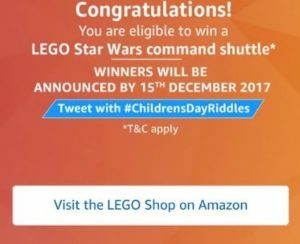 How to win LEGO Star Wars command shuttle from amazon ? 2. Open the app and you will see a banner about the Riddles Contest. Click on it. 4. You will now see a set of 7 questions/riddles which you need to answer all correctly to participate in the lucky draw. Q1) I can fly without a pilot, you’ll often find me in a bored classroom. What am I? Q2) Balance me on one finger or many to take me for a spin. I can help with both, concentration and distraction. What am I? Q3) Yellow, orange and full of angles, I was a classroom favorite for the 90’s kids, what am I? Q4) With me, you can climb up a rung or slide down with a hiss. What am I? Q5) I have a red Queen but no King. I have wood but no trees. What am I? Q6) Google paid me a tribute on its 50th anniversary and was in the ‘Everything is Awesome’ cast? What am I? Q7) I was NOT one of your favorite characters from Tinkle comics. Who am I? A user can participate by navigating to the page where 7 (seven) questions/riddles will be posted during the entire Contest Period. On answering all the quiz questions correctly, user will be entitled for a lucky draw which will be carried out amongst participants who have answered that particular question correctly. The declared winner(s) will be eligible for winning LEGO Star Wars Shuttle for free of cost.